But before we get ahead of ourselves let`s tackle things one at a time: as every year we invited all our wonderful distributors to a dinner in the event of the „Kind & Jugend“ trade show. Place of happening: das bauwerk. Right at this point we want to place a huge thank you: this goes to the complete team of this amazing event venue! You have supported us with great ideas and implemented our company philosophie with perfection in detail. Thanks, thanks, thanks! You and your location are simply amazing! Literally there can`t be much more highlights. But this evening indeed had more. First: the introduction. 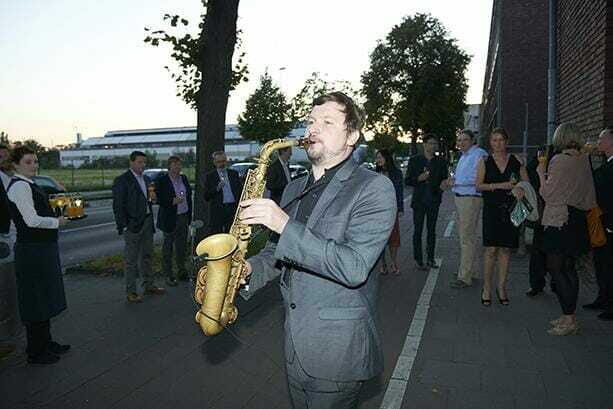 A saxophone player already performed outside of the venue to get us into the right mood before we even entered the location. Inside everything was bathed in atmospheric light. The mood was great. The next highlight: at a dizzying height an acrobat showed her performance by playing with wraps. Thematically coordinated to meet the product world of Ergobaby: Safe, elegant, charming. It was an instant success. And the third highlight? The –at first glance- very simple appearing white wall of the location suddenly changed and rolled out to present nothing else than a dessert dream buffet inside of it. Another wall followed which hid a bar and invited to drink a nightcap. Transforming walls. Amazing! Everything was harmonious. It was a very successful evening. This calls for a repeat!